Weighty Matters: food with a lower-case "f"! Though most of us call it, "processed food" in this case Mrs. Q. 's going to show us it's, "school food". She's an anonymous teacher, at an anonymous school, in an anonymous State, who's taken it upon herself to eat school lunch, "just like the kids", every day in 2010. She's also blogging about her experience. Her blog, Fed Up: School Lunch Project describes what we're feeding our children and while her school's in the States, there's no reason to believe things are any better here in Canada. What really blows me away - and I'm not talking about the obvious how can we serve kids the stuff we teach them is bad for us? What really blows me away is the fact that people make arguments about why it is we can't possibly change what the kids are eating because it'd be too difficult and/or too expensive. Really? You want to save money on the backs of our children's health? We shouldn't try because it'd be challenging? Great lessons for our kids there. Oh, and for the Canadian readers, too expensive? Can't just look at school bottom lines as we live in a country with socialized medicine where the effects of poor diets indeed hit the country's bottom lines (and bottoms). Too expensive to reform school food in Canada? I'd argue we can't afford not to. 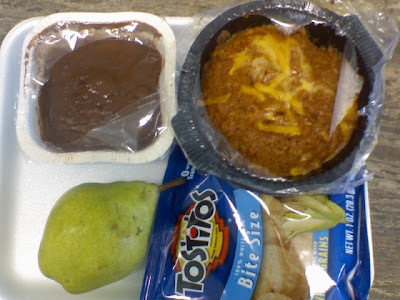 In case you're wondering what good school food looks like, Mrs. Q. provided a link to Madison Wisconsin's REAP Program. Have a peek and see what can be done. Just because something's tough to do, doesn't mean we shouldn't figure out a way to do it.